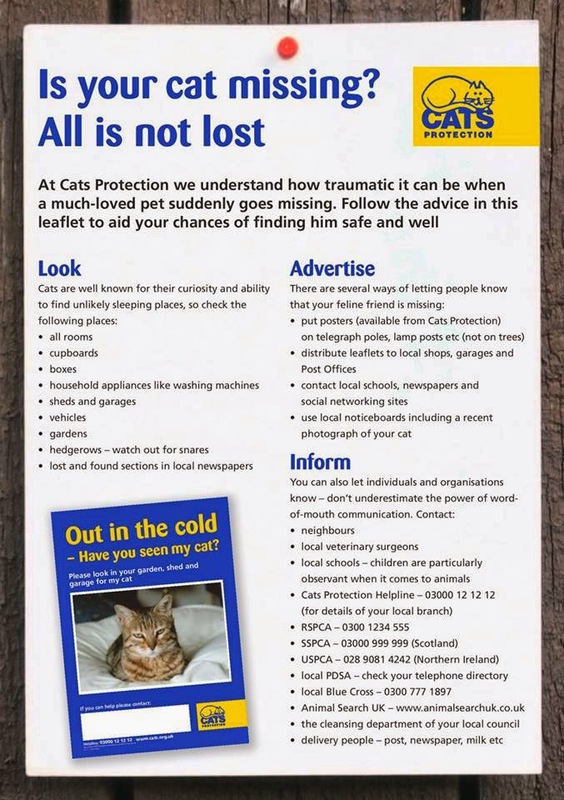 We get lots of requests from people to help them find lost cats and in fact I had a flyer through my door just a few days ago about a neighbours lost cat and many emails in my CP inbox with requests to help find lost cats in the last few weeks. It is a very stressful time for owners and while we would love to wave a wand and magic your fur babies home, it is just not that simple so here are our top tips. 1. Get your cat chipped and keep the info up to date, when your cat is found a rescue centre or vet surgery will be able to scan for a chip and reunite you. I can't stress enough how important this is...the internet is full of reunited stories and almost every time it has been a chip that has resulted in a happy ending. 2. Register on www.animalsearch.co.uk this is a valuable free service which works in partnership with Cats Protection. 3. Knock on neighbours doors and leaflet the local areas, ask people to check sheds, garages, out buildings and vehicles. Check up tree's as well, just a few weeks ago we were informed of a missing cat who was found, stuck up a tree after 3 days! 4. Put up posters in the local area and include a photo and details of any other distinctive markings etc. Street lamps and local noticeboards are good places to put posters. We have a lost cat poster template that you may find useful. 6. Try social media, it has an amazing reach! Facebook, Twitter and Streetlife are all good places to start. I am always so impressed with how our Facebook and Twitter communities come together to share lost and found cat stories... we all want to help so make the most of that! #lostcat and #foundcat help spread the word! 7. This sounds crazy but I promise it is not...empty the contents of your vacumn cleaner in the garden. The smell travels a long way and if your puss is lost, this scent might be just what he/she needs to find their way home. This worked about 2 weeks ago for a lost cat in Frimley.